Handheld Manual Coil Crimping Pliers cuts and crimps plastic color binding coils and spiral coil spines. 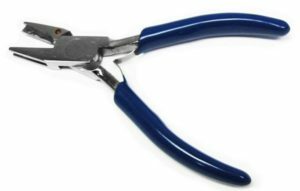 Our hand coil crimper is perfect for any coil binding project and compatible with all sizes of coil binding spines. Coil crimpers, handheld manual coil crimpers and crimping pliers cut and crimp plastic color binding coils and spiral coil spines. A coil crimper is perfect for any coil binding project and compatible with all sizes of coil binding spines. Hold the crimping pliers with the red dot face up. Align the pliers so the teeth are right below the center of the coil. Simply squeeze the coil crimping pliers to cut the coil. Keep the coil crimper closed. Twist towards the right to bend the end of the coil. Release the coil crimping pliers. Flip the book over to crimp the other side using the same method.